I don't really know where to begin or how to catch up. I have allowed my blogging to fall painfully behind. It seems like I have a constant dialogue in my head of things I need to blog about. There have been two more benefits for my family. I have been unable to write the Thank You post for these fun gatherings and the people and businesses that made them possible. These posts will come soon with links to all the amazing businesses in our community. Life has been very busy. I have received a total of 6 cycles of etoposide/sisplatin chemo therapy. My last treatment was on June 4th and 5th. I have had amazing people in my life step up and take me to all of these treatments. My chemo "dates" are bittersweet and intimate. It is a lovely time to catch up with some of the most amazing people in my life. Usually includes a great lunch, followed by some light retail therapy in Sedona. Dinner is out at a fabulous restaurant, and well if I can keep it down we have accomplished alot. Day 2 is a little more chill with a nap a nice lunch and a drive back home over the mountain. I have been on a chemo break. My baby T cell or white blood cell count was low. I was exhausted. It was summer time and I wanted to take the boys on vacation. The plan with Dr. Lindquist was to schedule my next PET scan for July 18th, review results, then plan chemo accordingly. We tentatively scheduled chemo for the 23rd and 24th and I lined up a couple of fabulous dates. So I planned a vacation in Kauai, Hawaii for my family. We spent a week on the garden island exploring, snorkeling, hiking, kayaking, eating, playing, and just enjoying one of the most beautiful places on planet earth. My boys are so grown up these days, they were great traveling companions. It is a joy to watch them grow and take in the world around them. 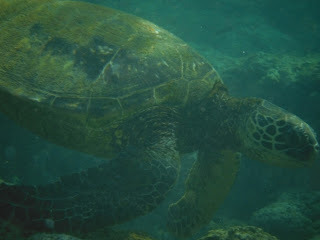 We had the joy of snorkeling with sea turtles, and more beautiful fish then imaginable. The "Aloha" pace of the island was so welcome. It was a complete 180 from the pace our family has kept since the cancer diagnosis. We needed to slow down and take in some beauty, talk about love and the things that are right in this world. This is easier to do when you are in paradise, add some shaved ice and a perfect sunset and the road is paved for everyone. We were just a beautiful family on holiday. Cancer didn't go with us to Kauai we all needed the vacation. Also during my chemo break I made a solo trip to Newcastle, CO to visit some dear friends. There is nothing like a 10 hour road trip for some quiet time in your head. Driving through the reservation, Monument Valley, Moab, only to arrive in beautiful Colorado is a spectacular back drop for some serious contemplation. My bike went with me of course, so it has officially become an inter-state love affair with my bike :) I will be making another trip up north in the near future with my boys for a wedding. Another highlight of my chemo break was a visit to my youth. Myself and 3 dear friends went to see Van Halen in concert!!!! Fun wild good times! Eddie Van Halen can still shred and we are contemplating Def Leppard and Poison in the fall. Now that I have cancer I am comfortable outing myself in regards to some of my musical tastes. Now the part you have all been reading for, the results from my PET scan. They are not as good as the last results. I have 2 additional nodes that have lit up on my left side and the other nodes have stayed consistent. That is the bad news, the good news is there are no tumors in my major organs or bones. The long and short is this is not what we had hoped for. I knew the journey would continue as I can still feel the nodes in my neck. What does this mean? I don't know I have been trying to wrap my head and heart around it. I am scheduled to meet with some more specialists on Tuesday. A place called T-gen, I am essentially adding them to my team. They do a lot of cutting edge research blah blah blah blah blah....I was pretty upset when I got the call. I was just coming off vacation. I have spent the last 6 weeks having fun and LIVING, now AGAIN cancer wants my attention. One would think I had given cancer enough over the last few years. There is nothing more frustrating then living like a healthy person, and scans tell you that you are not. I have been trying to wrap my head around this since Friday. I had a healing session with my friend Christi, followed by Yoga, time spent with dear friends, good food, laughter, an 18 mile bike ride a weekend full of love. So tonight I sit here and type, more centered and grounded then I have been in awhile. With a heart full of love and gratitude I try to sit in this moment and am thankful for all the healthy things that make up me. May I honor those, and my cancer as they all shape this blessed life that I am living.